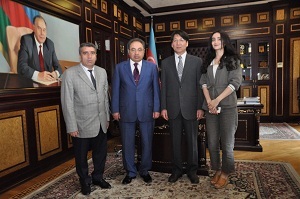 The President of BSU, academician Abel Maharramov met with Hirotaka Ikhara the professor of the Kumamoto University of Japan, and at the meeting the President gave information about the Azerbaijan-Japan relations, the study of Japanese language at Baku State University, Cooperation on science and education issues. During the meeting, were discussed establishing of new and continuation of old relations and student, master and PhD exchanges between Kumamoto University and BSU. 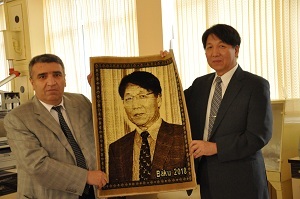 Then, Prof. Hirotaka İhara has been to NanoResearch Center and together with Prof. Mahammadali Ramazanov has discussed about the outline of the research work that PhD. 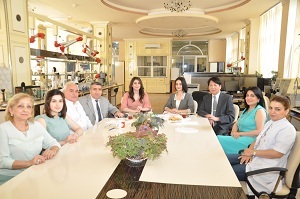 Student Rahimi Almara will undertake during her visit to Japan. It was decided that she will deal with the synthesis of the polymer coating on the surface of SiO2 nanoparticles as a result of polymerization of monomers and subsequently carbonization as a result of thermal processing. Discussions about the construction the drugs on the surface of such substances and about possible prospects of application of these materials in the targeted drug delivery in the future were held. The application of such materials as luminescent material was also noted. In the future, the use of this technology to transport drugs to cancer cells has also been discussed and agreed on the carbonization of the surface iron oxide nanoparticles and the construction of the drugs on the surface of nanoparticles. We would like to note that the second employee of the Nanotechnology Center is conducting fundamental research in Kumamoto University of Japan.